Waynesboro, VA – Twenty members of the Fishburne Military School Key Club got into the spirit of the season on Saturday by volunteering their time at the Second Annual Waynesboro Public Library “Haunted Library”. The Cadets loaned their talents in a number of ways in order to help make the event a success for area children. Some spent their evening made up as zombies and delivered friendly scares to any kids brave enough to enter the Haunted Maze constructed within the library. 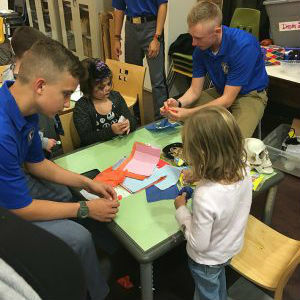 Others spent their time helping the youngest visitors with various Halloween-themed craft projects. The event drew over 400 parents and children, nearly all dressed in their own Halloween costumes.